Made this today…. I love it! 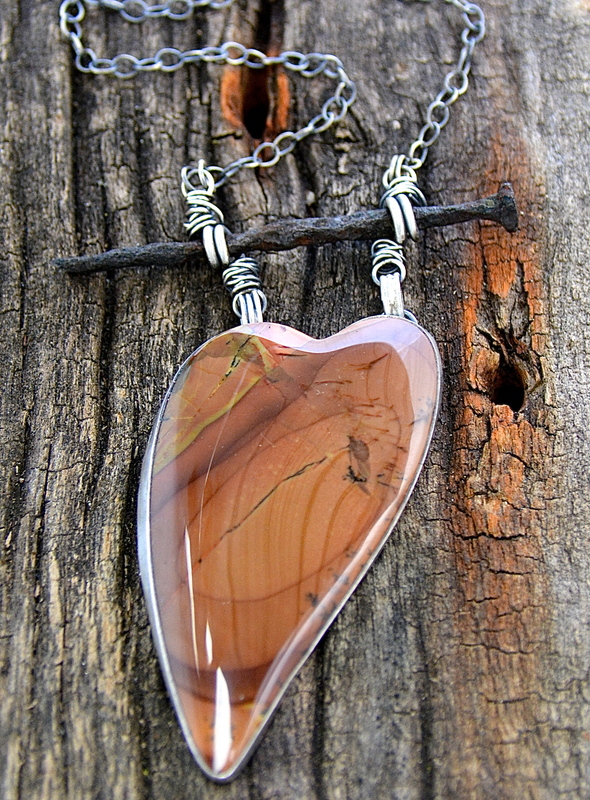 The heart is a Jasper Stone…The nail comes from a walk with my daughter out to this old concrete structure on our land. The concrete structure was a wash tank for gravel in the 1920’s. There are still shoots coming of the side of it to load train cars with gravel and the train tracks are still in place beyond the concrete tank (it’s almost 2 stories tall and has 3 or 4 compartments in it so it’s like a building). We found this nail with a lot of other iron relics inside the building and around it. There is a lot shrubs and trees growing around everything so you have to hunt for your treasure! Tomorrow I am heading to Elements Unleashed…. a boutique in downtown Neenah Wisconsin. I hope we hit it off and have a start to a great new relationship. 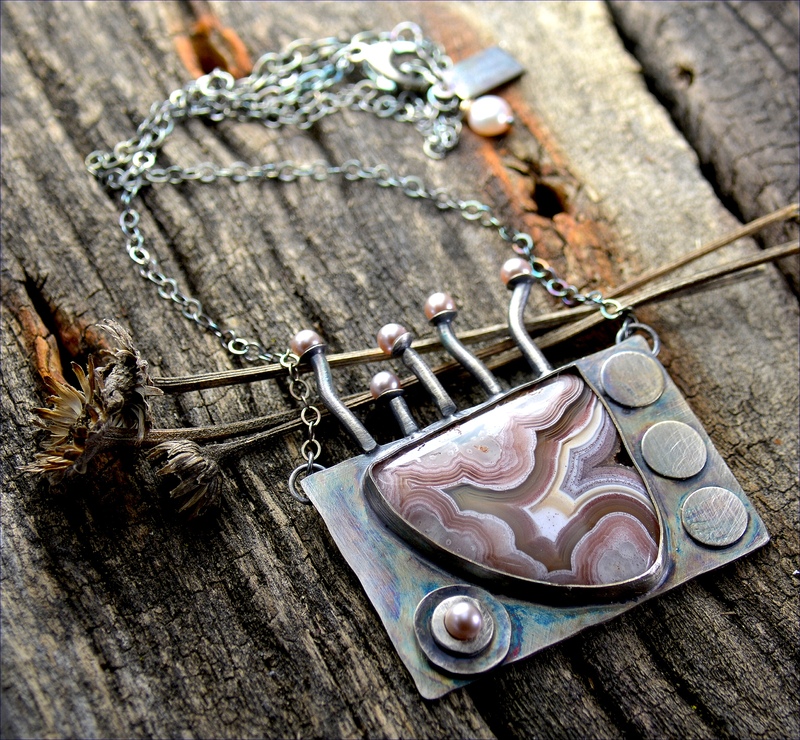 I hope they will be a new retailer for Wild Prairie Silver Jewelry. I have been wanting to go there for about 10 months! 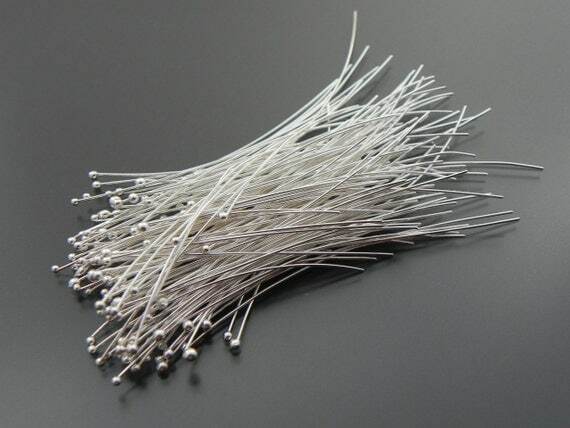 That is what winter is for…making new things and developing new business. Thanks for having me Elements Unleashed. From the looks of the boutique I might leave there with a new wardrobe. They have awesome boots. I love boots. 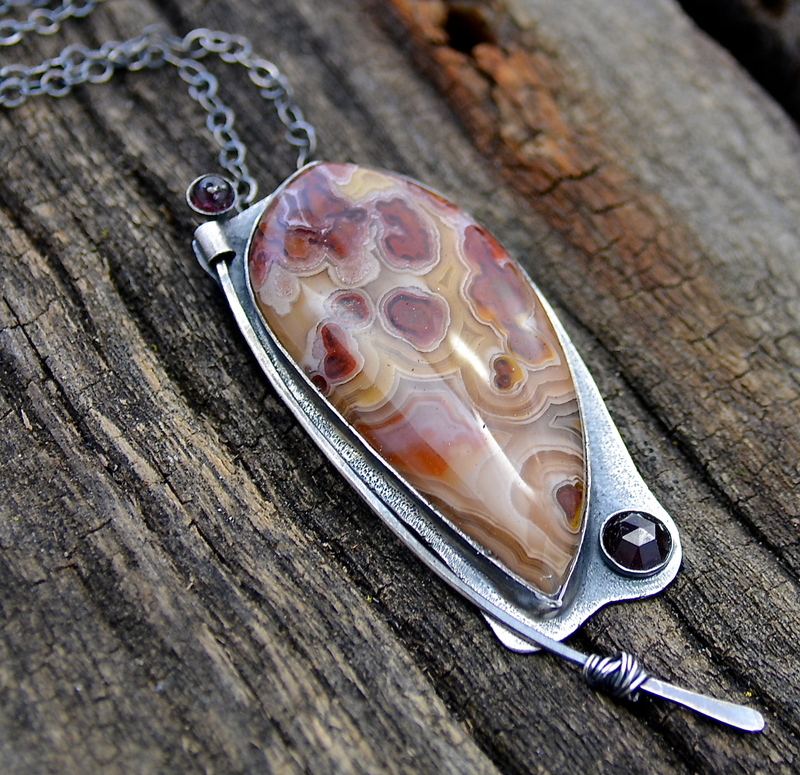 Crazy Lace Agate Garnets… The stick is free to move, nice unexpected movement and it can’t go anywhere…it’s trapped. 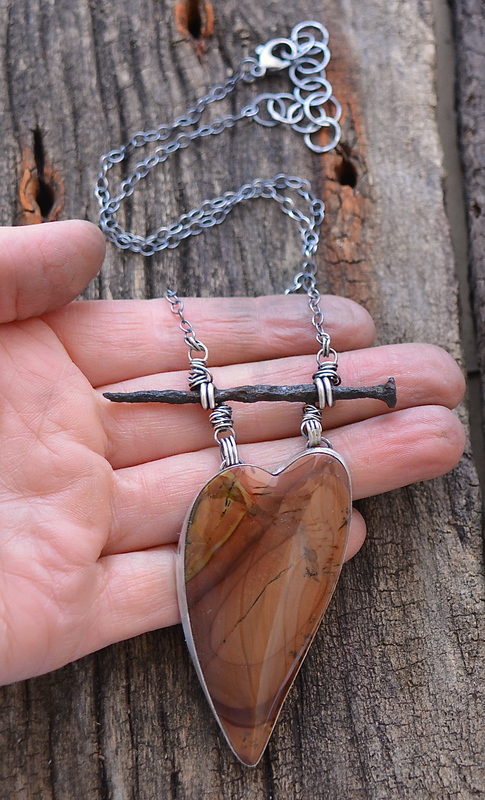 Link: https://www.etsy.com/listing/177446446/sterling-silver-crazy-lace-agate-stone? 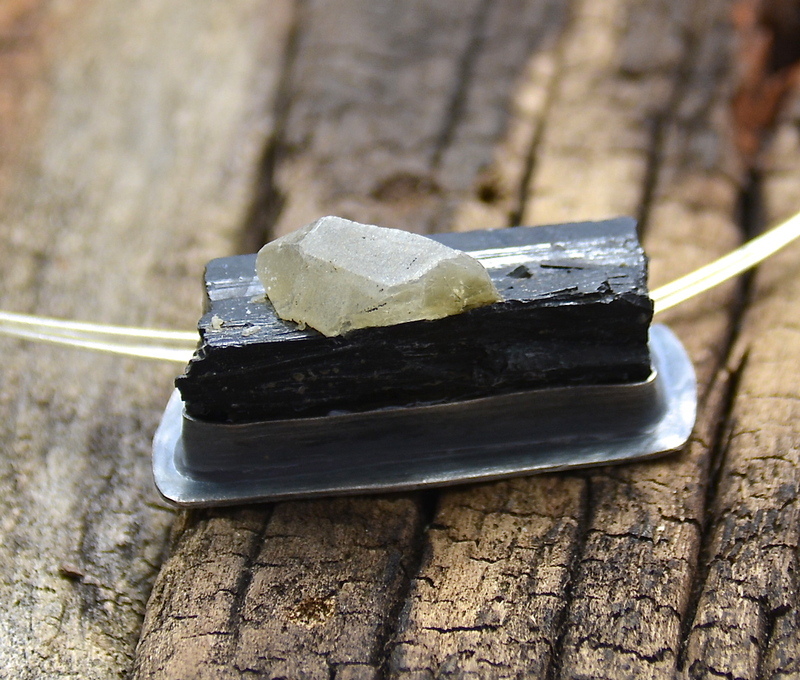 This is a piece of quartz trapped in a piece of Tourmaline. 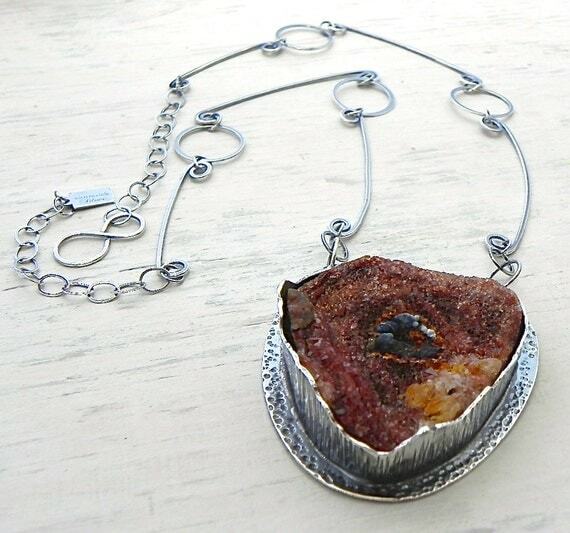 The stone was great but this is a very unusual piece for me to make. For starters it’s a regular size… a size anyone would love to wear. 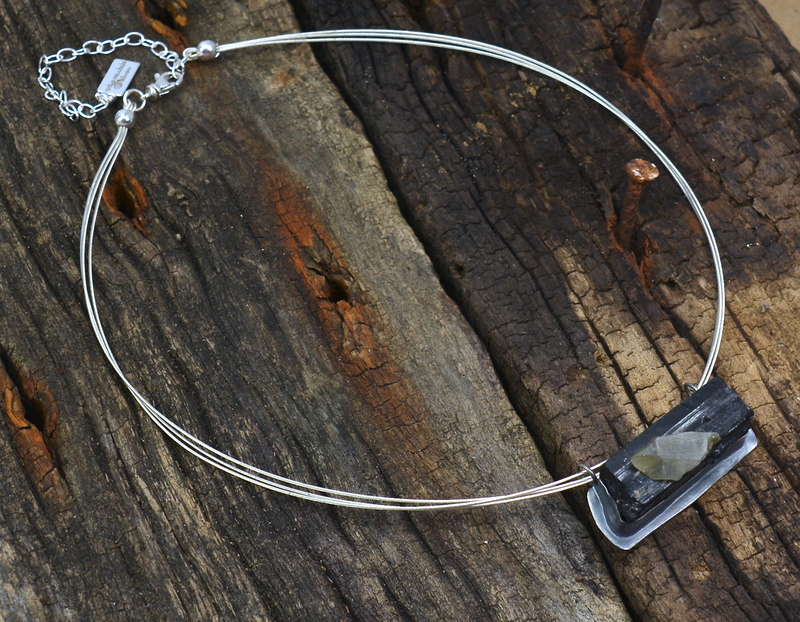 The chain is 3 cables of sterling silver. I love it and could actually see it on a guy. Link: https://www.etsy.com/listing/177445737/sterling-silver-tourmaline-specimen? 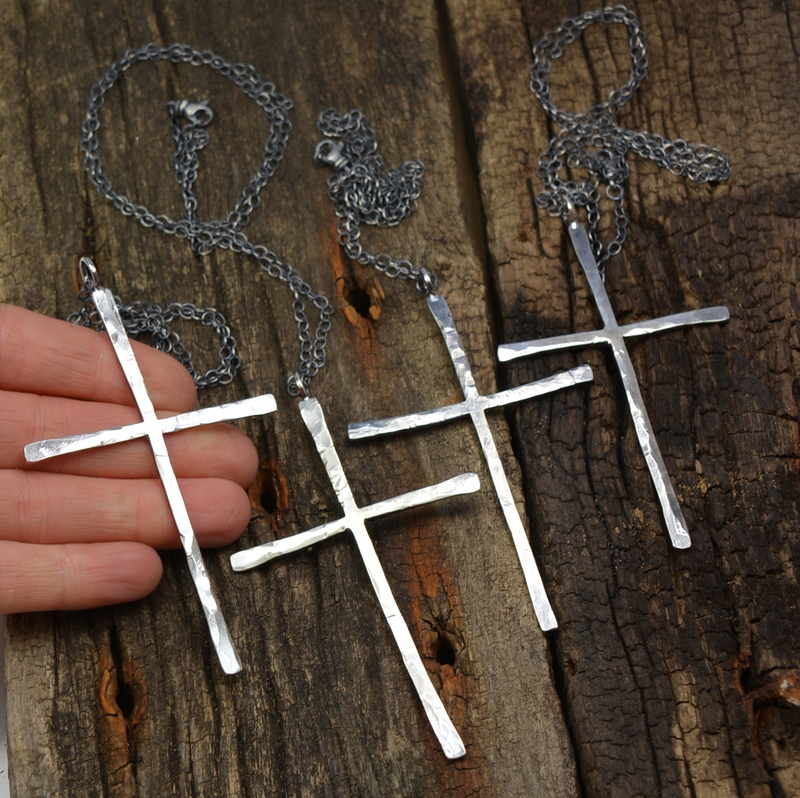 Last but not least… huge oversized cross…. 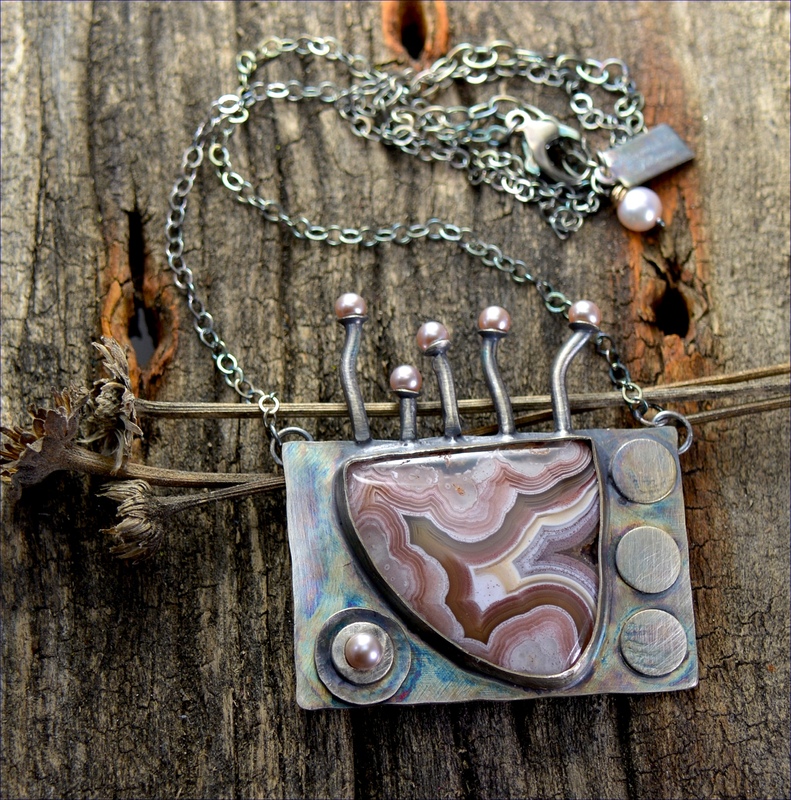 3.5 inches long x 3 inches wide on an oxidized chain. It looks great long or as a choker. 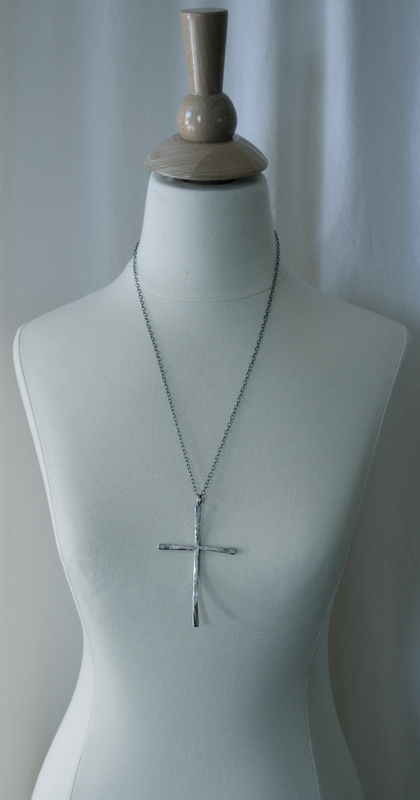 Link: https://www.etsy.com/listing/177455087/sterling-silver-huge-hammered-cross? Just made this piece on Thursday. It was really fun. 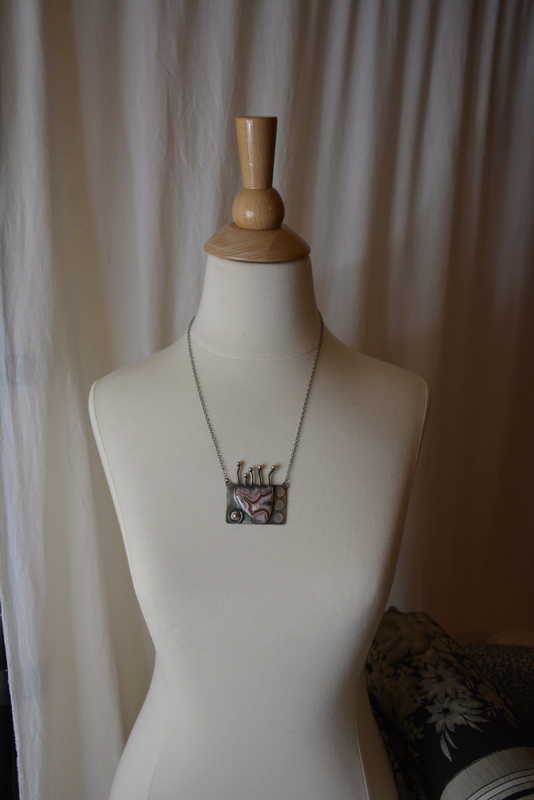 I was like a kid in a candy store to make a new piece…so much more to come! Also made an 18K Gold White Topaz Engagement Ring. Making Gold Engagement Rings and Wedding Bands is really going to be a new direction for me. 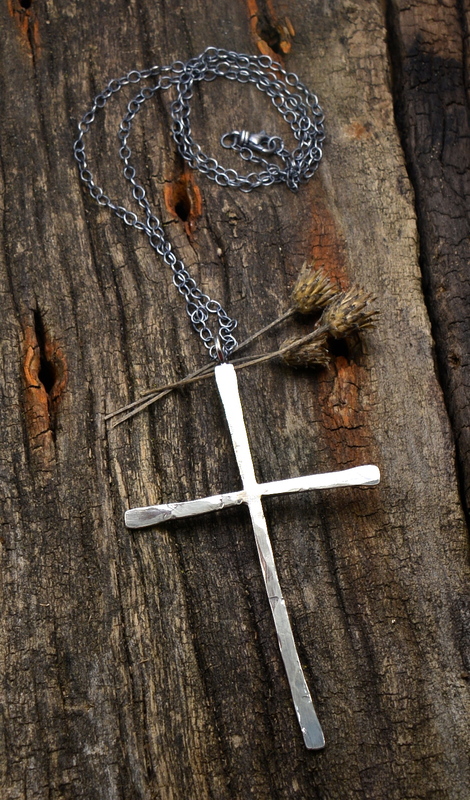 It means a lot to me as well to have those pieces of jewelry out there in the world made for such a special reason. Booking new shows for summer already! It is hard to believe March 9th will be the first show. It will be here fast! In the mean time I started training for my 8th marathon. This is a big undertaking but it’s worth it. Wish the weather would cut me some slack. It’s hard to run in slush and it’s hard to run in -0 temps….any temp above 10 degrees is fine… so come on Mother Nature and give me a week of goodness & sunshine. Much more new things to come and some new shop tools as well.